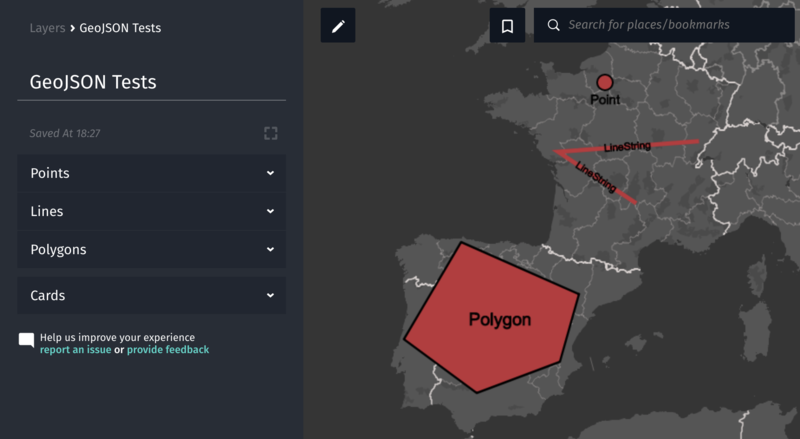 Are you just getting started with GeoJSON? If you are not already familiar with the format but want to make a map with HERE XYZ (public beta) you may be trying to come up to speed quickly to take advantage of the geospatial data storage in HERE XYZ Hub or rendering capabilities for customization in HERE XYZ Studio. 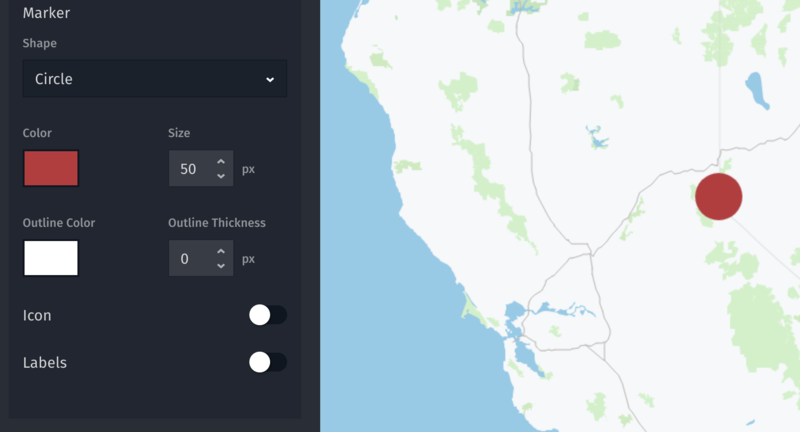 You can read the documentation for GeoJSON Basics but let's start with a quick primer that will have you drawing circles in no time. A few months ago we celebrated 10 years since the original GeoJSON spec was proposed. The IETF would go on to formalize it as RFC 7946. As much fun as reading a technical spec is, here’s what you need to know. We're just talking about latitude and longitude here but the order matters and in the case of GeoJSON X comes before Y which means longitude first in the order [longitude, latitude, elevation]. If you've worked with other Geospatial data formats, you will quickly recognize some similarities. With coordinates representing a location on the globe, we can add a type that defines the shape of basic geometry. The Point, LineString, and Polygon represent the three primary types. The Point is rendered as a dot. The LineString is rendered as a series of points connected with a line. The Polygon is a chain of line segments in a loop for the purpose of rendering a filled shape. The first and last coordinates are identical to make sure the linear ring is closed. In addition to the basic geometry types there are MultiPoint, MultiLineString, and MultiPolygon. It may not be a surprise to know that these are just simply extensions of the basic types to represent the coordinates as an array of arrays. It is not necessary to use these types but it becomes helpful for the compactness and parsing of the resulting GeoJSON file. To add context to your geometry there is a Feature type. By enclosing both geometry and properties together you can add real world metadata or attributes to the shapes defined in the geometry being rendered. You can also define a FeatureCollection that like the Multi types is a list of lists for defining many features at once. There are many public / open data sources that provide GeoJSON data for download. You can fire up a text editor and start typing. You can use HERE XYZ Studio and GeoJSON Tool. As you may have seen in the XYZ Studio Quick Tour, Studio has a mode where you can create or edit content. The -r dumps out the raw GeoJSON content which you can pipe into a file. You'll notice that Studio stores the geometry in a FeatureCollection along with some metadata properties. Alternatively, you can also use GeoJSON Tool which has a built-in text editor and viewer for writing GeoJSON and viewing the results. It has an easy to remember URL as well -- http://geojson.tools. Drawing circles could be handy if trying to represent radius around an area such as the no-fly zones for drones around an airport or the flight radius of a nesting European Swallow. Using XYZ Studio you can customize your map to change the look and feel which means you can bump up the size and color of a Point to look like a circle. You may be tempted to draw a circle in GeoJSON, but first think about what you’re trying to display. Scaling the size of Points is best if you wanted to show the magnitude of an earthquake or to scale a Point based on a property like we did in the Madrid Air Quality Tutorial. If you wanted to show a circle with a specific radius (for swallows), remember that GeoJSON doesn't natively have a Circle type. This was intentional as drawing circles on a flat surface which is really a spheroid gets tricky. You can use your favorite programming language or tools to make a Polygon with a large number of sides to approximate a circle. Depending on the radius and zoom level you may want to experiment a bit. You’ll need to setup a Python environment and pip install shapely geojson for this to work properly. 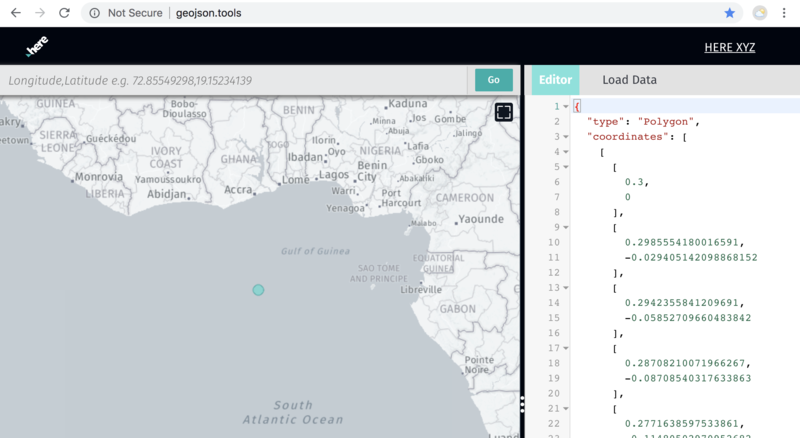 Copying and pasting the output from running that Python code into geojson.tools renders a nice circle in the Gulf of Guinea. This was not an exhaustive study of everything you can do with GeoJSON but aimed to get you started. From here you should check out the GeoJSON Basics documentation for more detailed examples. 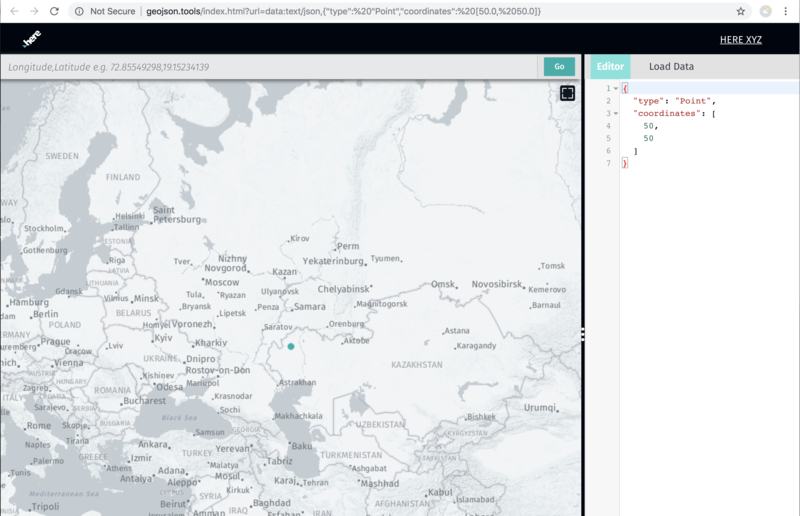 From there you can start using the GeoJSON Tool or HERE XYZ Studio as interactive editors to experiment with GeoJSON for yourself.